AdWords advertisers have two basic options for where their ads can run: Google’s Search Network and Google’s Display Network. This post will provide a general overview of each. The Shopping option is a subject for another time and will not be discussed here in detail. A Shopping campaign is basically an option for online retailers to advertise their products with pictures. It requires a Google Merchant account which must be integrated with your website. Search Network with Display Select is the default campaign type. Never use this setting. For an account to be set up and optimized properly, Search Network and Display Network campaigns should always be kept separate. The Search Network is what most people think of when they think of Google. You go to google.com, enter a search query, and land on a set of results. Most of the time, you will see ads on the top of the results, and on the right side of the page. 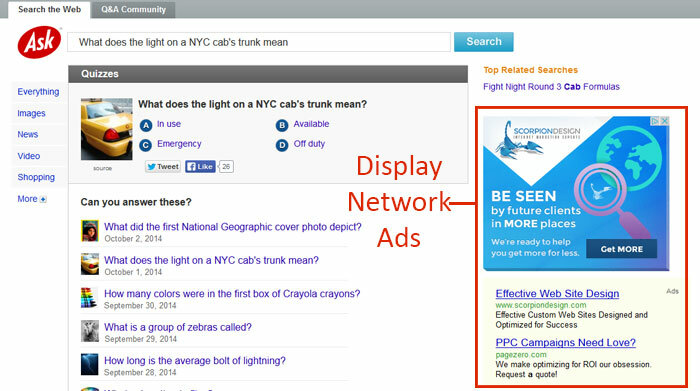 If you advertise on the Search Network, this is where your ads will show up. Google is where people go to find what they are looking for. It is the modern day equivalent to the phone book or the library. If you offer a product or service that people are looking for, the Search Network is the best place to advertise it. Alternately, the Display Network is the modern day equivalent to newspaper ads and billboards. Display Network ads show up across the internet on various websites that have opted to show AdWords Display ads. They can be image ads (banners) or text ads. When someone clicks on the ad, the website owner gets a cut of the advertising spend. It is an easy program for website owners to sign up for, it can be very profitable for them, and it has become the largest network of ads on the internet. 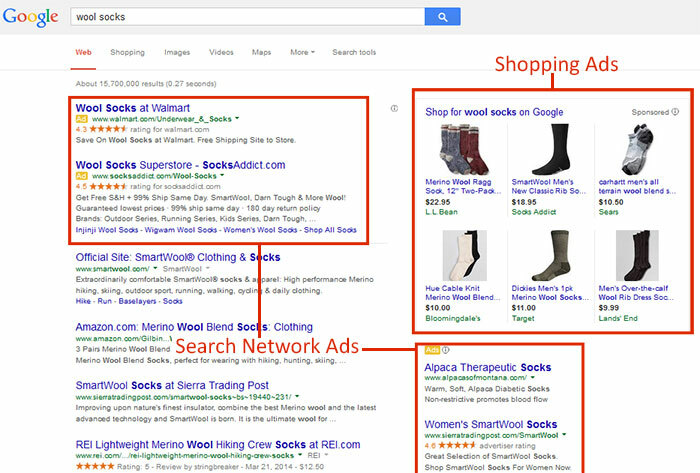 Display ads are much trickier than Search ads. They require that you interrupt what someone was doing, get them to shift their mindset and come to your website, and ultimately get them to purchase your product. Because of this, Display ads usually have a much lower rate of success than Search ads. The Display Network is not recommended for most new advertisers. Many businesses should never run Display ads. There are benefits of the Display Network and ways to advertise successfully. You can target your ads based on the content of the website, and can even limit your ads to show on specific websites. You can target users based on demographic information. The Display Network is also where you can run ads for Remarketing campaigns, which is how you can target previous visitors of your website. This post just scratches the surface of Google’s Search and Display Networks. The main thing to recognize is that they are completely different advertising vehicles and should be treated as such.